Happy hump day (aka Wednesday). 1. Premarket movers -- Disney, Chipotle, Pharma & Jam: Shares in Disney (DIS) are rising by 4% premarket after the House of Mouse reported quarterly results that easily beat Wall Street expectations. Shares in Chipotle (CMG) are slipping in extended trading after a whopping 26% jump in quarterly sales failed to satisfy investors. Pharmaceutical stocks are also on the move. Shares in Gilead Sciences (GILD) are dipping by 4%. The company is reported to be offering larger-than-expected discounts on its pricey Hepatitis C drug. Pfizer's (PFE) stock is up by 2% after the U.S. Food and Drug Administration granted accelerated approval for the firm's high profile breast cancer drug, Ibrance. Shares in J. M. Smucker Company (SJM), known for its jams and food products, are up by about 5% premarket after the company said it was buying Big Heart Pet Brands for $3.2 billion. 2. 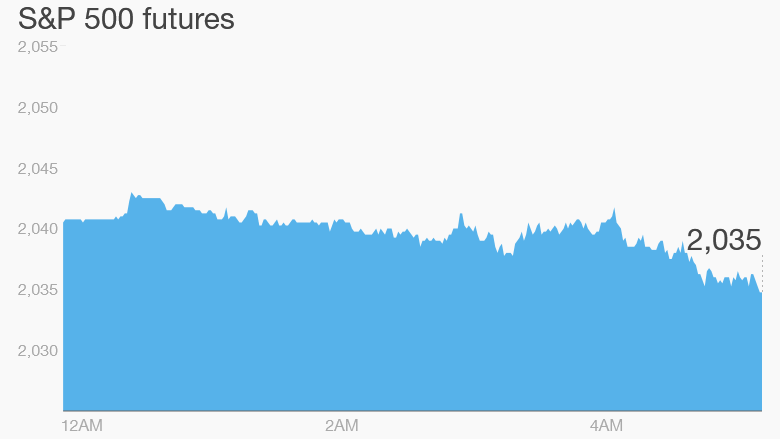 Stocks slipping: U.S. stock futures are edging lower after markets closed with impressive gains on Tuesday. The Dow Jones industrial average surged by 305 points, while the S&P 500 rose 1.4% and the Nasdaq gained 1.1%. Much of Tuesday's rally was attributed to higher oil prices. A recent crash in oil prices has spooked investors over the past few months. Crude futures are slipping back to about $51.50 per barrel, but that's still much higher than last week when oil was trading below $44. 3. Expecting earnings: Sony (SNE) came out with a preliminary forecast, predicting net income of 89 billion yen ($755 million) for the third quarter. It said it doesn't expect its annual earnings to take a hit from a major cyberattack that crippled computer systems at its Hollywood studio. Last month, Sony asked regulators for an extension to file third quarter earnings due to the hack. Final results will be announced March 31. Also in Japan, Toyota (TM) forecast a slight decline in future vehicle sales but expects profits will improve, partially due to favorable foreign exchange moves. In the U.S., General Motors (GM) and Merck (MRK) will report earnings before the opening bell. Keurig Green Mountain (GMCR), 21st Century Fox (FOX) and Yum! Brands (YUM) will report after the close. 4. Greek drama unfolds: Greece is still top of the agenda in Europe as political leaders and policy makers try to hash out a solution to the country's debt crisis. Greece's finance minister is at the European Central Bank, which could discuss whether to extend emergency support for the country's banks. The main Greek stock market index is falling by about 6%, after staging a strong rebound the previous day. The new government of the heavily indebted country revealed a plan this week to restructure its debts. The nation is hoping to swap debt for growth-linked bonds, but it is far from certain that European lenders and the International Monetary Fund will agree. European markets are mostly declining in early trading, while Asian markets mostly closed the day with gains.